For over 25 years Jan Fabre, born 1958 Antwerp, Belgium, has occupied a leading international position as a ground-breaking visual artist, theatre-maker and author. In the late seventies he went to Royal Academy of Fine Arts, Antwerp and to the Municipal Institute for Decorative Arts and Crafts, Antwerp. He became famous for his deep blue pen-drawings of Het Uur Blauw (1977-1992), Tivoli Castle (1990) and Heaven of Delight (2002), the jewel beetle-studded ceiling of the mirror room at the Royal Palace of Brussels, public sculptures like The Man who Measures the Clouds(1998), Searching for Utopia (2003), Totem (2004) and recent installations like Chaptres I-XVIII (2010) and Pietas (2011). Drawings, sculptures, objects, installations, movies, performances, thought models,… all of Jan Fabre’s works refer to a belief in the vulnerable body, its defences and looking at man while posing the question of how he can survive in the future. This fascination with the human body and science goes back to Fabre’s childhood where he, influenced by entomolgosist Jean-Henri Fabre’s (1823-1915) research, preferred nothing more than to study insects and other creatures, dissecting their tiny bodies and transforming them into new creatures. With the expo “My Queens”, Fabre honours the important women in his life while simultaneously creating a dialogue with the Flemish artistic tradition. 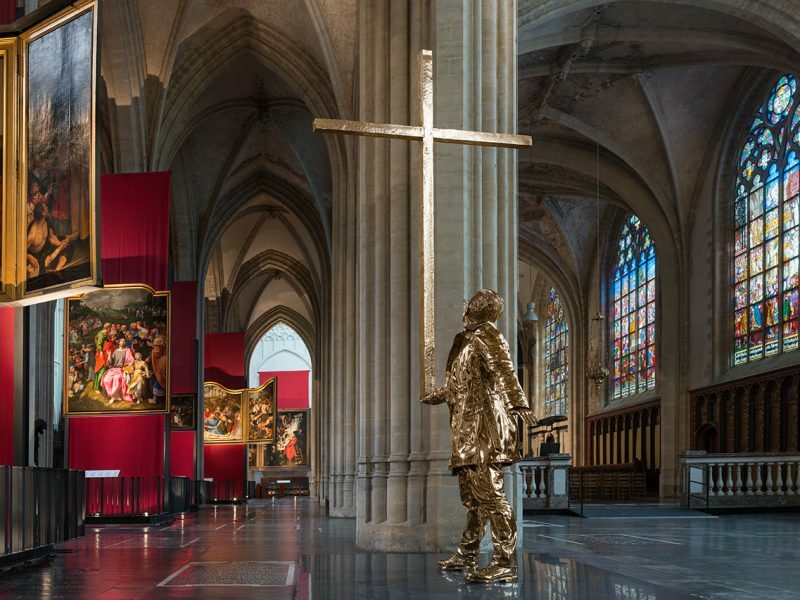 Jan Fabre is the first living artist to have a solo exhibition at the State Hermitage Museum in St. Petersburg.